NEW HAVEN, Connecticut — Late in the third period of Friday night’s game against No. 15 Yale University, there was some confusion among the skaters on the ice for the No. 12 Boston University men’s hockey team. The Terriers had already pulled sophomore goaltender Connor LaCouvee for an extra skater, but there was a slight issue. BU had seven skaters on the ice when there should’ve been six. After some discussing and finger pointing, the problem was sorted out and the Terriers (8-6-3, 4-3-2 Hockey East) had the correct number of skaters to finish the game, although they probably wished they could’ve gotten away with sneaking in an extra, extra forward. They made it close in the end, but the Terriers fell to Yale, 3-2. Bulldogs (6-4-2) forward John Hayden scored twice, including the game-winner in the third period to propel Yale. It wasn’t BU’s best effort by any stretch, so here’s a breakdown of the loss at Ingalls Rink. Honestly, we could have just copied and pasted this section from a bunch of other stories we’ve written, but it really held true again. It wasn’t like the Terriers got severely outplayed from the outset, and they even got on the board first with senior forward Ahti Oksanen’s ninth goal of the season, but there just seemed to be a flow missing. Part of that could be attributed to Yale’s strong defense and goaltending from Alex Lyon, who had a 1.78 goals-against average coming into the game. Any way you slice it, BU was outshot 28-19 after two periods, and trailed by a goal after those 40 minutes. It was the eighth time since Nov. 13 at Providence College that BU has entered a third period either trailing or tied. Yale was already crawling back into the game, and freshman forward Ryan Cloonan did his team no favors by taking a five-minute major and game misconduct penalty on a hit he threw in the neutral zone at 19:03 of the second period. Thirty-seven seconds into that major penalty, Hayden scored the first of his two goals on a perfect passing play set up by the Bulldogs that started down low from the right-wing boards and eventually to Hayden in the slot. It would be the only goal the Bulldogs would get on this man advantage, but having Cloonan out of the picture meant an already shorthanded BU group was forced to play down a man for the entire third period. Without senior captain Matt Grzelcyk and sophomore defenseman Brandon Hickey, it was going to be a challenge for the remaining BU defensemen to step up to contain Yale. But, much to their credit, the blue liners played well for most of the game. Although they made smart plays a majority of the time, when they did mess up, it directly cost the Terriers. The goals, most notably the first one, all appeared to involve a missed assignment or failed coverage. BU had just called a timeout after it iced the puck in the middle of the second period, and off the ensuing faceoff, forward Ryan Hitchcock somehow snuck open near the net and beat LaCouvee on a rebound to tie the game at one with 1:47 left in the second period. “Coach reiterated all week that they’re not going to beat themselves and unfortunately their first goal and that power-play goal wasn’t great plays on our part, you can’t let them get a lead like that because it’s tough to score goals against them,” said junior defenseman Doyle Somerby. 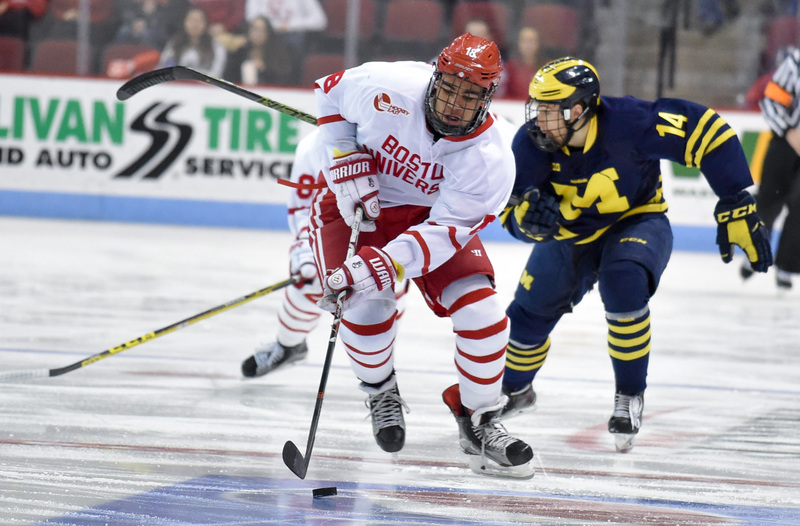 Like other highly touted recruits from the U.S. National Team Development Program, freshman forward Jordan Greenway had his fair share of hype coming into his first year on Commonwealth Avenue. The faith in Greenway seems to finally be paying dividends. Greenway has five points (one goal, four assists) in the last four games, upping his point total to seven on the year. On Friday, he had the primary assist on Oksanen’s second-period strike on a pass set up from behind the goal line and to the slot. Playing down a skater is never easy, but when it’s even more difficult when it’s for five minutes. But BU, despite giving up one power-play goal on the major penalty, clamped down for the final 4:23 of the penalty, and didn’t allow Yale to again find the back of the net while on the man advantage. Judy has you covered on this part of the game in her sidebar.